I'm trying to quit "trying." Sounds very meta, but stick with me. This seemingly paradoxical concept really hit home during a seminar I was taking. The seminar leader placed a pen on the floor next to a participant and said, "Don't pick it up. Just "try" to pick it up." The participant responded with a look of confused amusement and the rest of the class laughed. After a few more encouragements by the teacher prompting the student to keep "trying" she went on to explain that no matter how hard we "try" to pick up the pen it will just continue to sit there. Simple concept when illustrated with the act of picking up a pen. Nonetheless, I find myself "trying" all too often in my own life. "I will try to do it," I say to myself and others. But "trying" is a trap. It's thinking about doing something instead of doing something. It's the great differentiator between highly successful people and the moderately successful. Richard Branson comes to mind here. He's started over 400 businesses. You cannot start that many businesses by "trying." Branson is the ultimate doer and I've heard stories about his screw-it-let's-do-it-attitude. Virgin Airlines was started because his flight was canceled and instead of "trying" to find another flight he immediately went and took action. Branson rented & charted a plane to his destination then turned around and sold all the seats on "his" plane to the fellow travelers whose flight had also been canceled. Problem solved. New business conceived. This is what entrepreneurs do. Create solutions to problems. This was before Branson had all the money & the fame. But this way of being has been his hallmark and has led to a hugely successful life. Tony Robbins talks a lot about this as well constantly promoting the mindset of "taking massive action now." Stephen Covey, author of The 7-Habits of Highly Effective People, claims the same key to this success-principle with the idea "initiative & resourcefulness", something he taught and lived at home with his family with the constant reminder to "use your I & R" in all of life's challenges. The CEO of my company has the same mindset. We've had plenty of conversations about it when talking about what's important in building a sustainable startup. He calls it "a sense of urgency." I've been around since the beginning of the company as a founding team-member and I've always been amazed by and had admiration for his ability to take quick action. Definitely one of the reasons we have been so successful. I'm pretty good at taking immediate action when it comes to my work at Ohmygreen. Where I find myself struggling most is in my life outside of our startup. Particularly, the area of my creative unfoldment -- this blog & a podcast I am building. I believe a large part of this stalling is my own perfectionism and indecision. I find myself constantly "trying" to do it perfectly, "trying" to find the best option, "trying" to learn more before I "do". In Tony Robbin's Personal Power II he explains that that to "decide" means to cut off in its original greek form. That is what I need to do with my creative work! And in any area where I am finding myself moving slowly or not at all. I just need to take action. Even if it is the wrong action at least I am doing something and I'll learn. "There is no failure. There is only feedback." I find that when I repeat that quote to myself when I am in the throws of indecision it empowers me to unbind myself from having to do it "right" or "perfect" and actually do something. Know your outcome. Get clear on what you want. Clarity gives you power. Notice if the action is working or not. In other words, know what you're getting. Tony calls this "sensory acuity." Do something else if current action is not working. Obvious, but I've caught myself continuing to do the same action that is not working just because I've already invested energy in doing it that way. I actually spent well over a year doing something that was not working for me. My own obstinance is something I constantly have to watch out for. Repeat steps 2-4 until step 1 is achieved. Bonus: use modeling to accelerate the process (more on that here). When I see the formula for success written out like it is above I almost laugh at myself at how simple it is. Another part of me (the inner saboteur) says, "It cannot be that easy. It must be complicated!" Yet, when I look back on pretty much every single accomplishment (big or small) that I have achieved it was done through those four (4) simple steps. Leonardo Da Vinci had it right when he said, "Simplicity is the ultimate sophistication." Having a mission and/or purpose in life empowers me to make quick & definite decisions. Purpose creates energy for action. My purpose is to empower people & organizations to transform & self-actualize. Taking action is a habit you can build. Indecision is a habit you can break. Practice taking action every day in every way. Replace "trying" with either a "yes" or a "no." Embrace the opportunity to get feedback by taking action. This is the fastest way to learning & achieving. Guard against over-thinking by setting limits & boundaries. I.E. I will think about this for 15-minutes max then I will make a decision and do something, anything, even if it's likely to lead to failure (feedback's favorite disguise). Perfectionism is the tool of fear and it will kill your life. 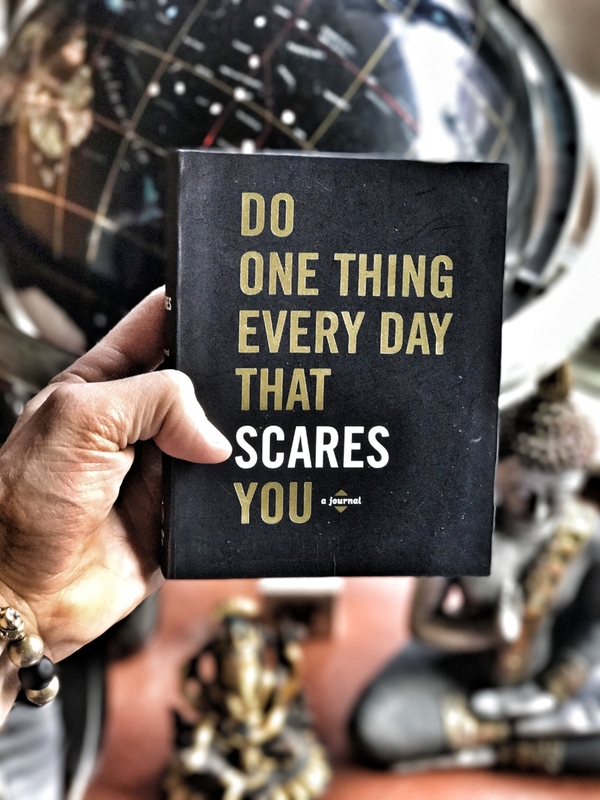 Do One Thing Every Day That Scares You: A Journal by Robie Rogge & Dian Smith. I have this book sitting on my home-office desk with the title easily visible. It is a friendly reminder to keep taking action and doing things I am scared of, aka the things that make me grow & improve. In other words, do things that deliver upon my self created purpose (empower people & organizations to transform & self-actualize). Uncertainty: Turning Fear & Doubt Into Fuel For Brilliance by Jonathan Fields. This is an awesome book for taking the energy of fear and alchemizing it into action. Highly recommend! The Art of Taking Action: Lessons From Japanese Psychology by Greg Krech, founding Director of the ToDo Institute, an educational institute for purposeful living. This is a really awesome book that deeply explores "action" from a zen-perspective. A relatively unknown gem in my opinion. Fits right in with Yoda's "do or do not" philosophy. The 7-Habits of Highly Effective People by Stephen Covey. Brilliant. A classic. Everyone should read. It will empower you to develop a life-mission. Having a "purpose" to life alchemizes everything you do. Screw It Let's Do It by Richard Branson. Awesome short read from one of my favorite leaders. Pick one area where you have been stuck in indecision and take one action today. Make this one of your life -mantra's: "There is no failure. There is only feedback." If you don't have a mission/purpose, then your mission is to find and/or create a mission. You can always change your mission/purpose so don't be afraid of starting with something simple or even "my mission is to find my purpose." Even this mission will create energy for action. Still stuck? Go on a Vision Quest. This will bring you clarity and put you in an environment where you will find your mission. My dear friend, Ben Sanford, facilitates these transformative experiences throughout the year in the lush forests of the Evergreen State (WA). Check out Tribal Edge for more info. "Trying" lives in the land of fruitless struggle & stagnation. "Doing" is the infinitely abundant land of movement, achievement & growth. Join me in quitting "trying." Let's get of our own way and DO! P.S. Another huge aspect of taking action is knowing how you personally meet internal & external expectations. This article includes a short 5-minute personality test that will reveal just how you do that. P.P.S. Positive transformation & self-actualization is a never-ending process so best to embrace it, have fun with it, and do it with others! Join us and sign up for my NEWSLETTER!